The Kingaroy Concerned Citizens Group says 174 South Burnett landholders – and 323 parcels of land – would be directly affected if Moreton Resources’ proposed coal rail line goes ahead. The KCCG recently gained access to various documents from the State Government under Right To Information processes. 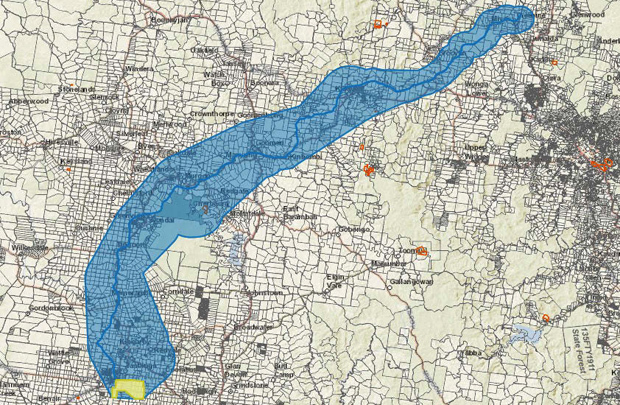 The documents include maps which show in more precise detail the rail route proposed to take coal from Kingaroy (if the mine goes ahead) to the coast. The route mostly shadows the former Kingaroy-Theebine rail line, now being used as the recreational South Burnett Rail Trail. KCCG spokesman John Dalton said although towns would be spared having a coal train through their main town streets, the surrounding areas would be hardest hit with the proposed route passing through many privately owned properties. “It is the responsibility of the proponent, Moreton Resources, to engage with affected landholders in a proactive manner, and inform them of the likely impacts of coal project,” Mr Dalton said. Neil Hutton, who lives in Wessling Road at Wondai, said the proposed coal rail line would pass just a few hundred metres from his house. He believes the noise and dust would be devastating. “We would be unable to continue living here if the proposed coal rail line went ahead,” he said.